I just returned from a visit to the dam dippers. Watched for 15 min and saw only the Great Blue Heron. It flew in over the spillway and had a white something trailing from its bill. Flew downstream without landing so I could not see details. An adult dipper flew in from downstream and foraged in the whitewater at the bottom of the spillway, SANG, them flew up to the nest. The other adult also flew in from downstream with food, foraged a little, then up to the nest. One adult came down and rummaged around in the pool, stood on a piece of driftwood and sang. This kind of behavior seems to indicate that they are trying to wean their chicks and entice them out of the nest. 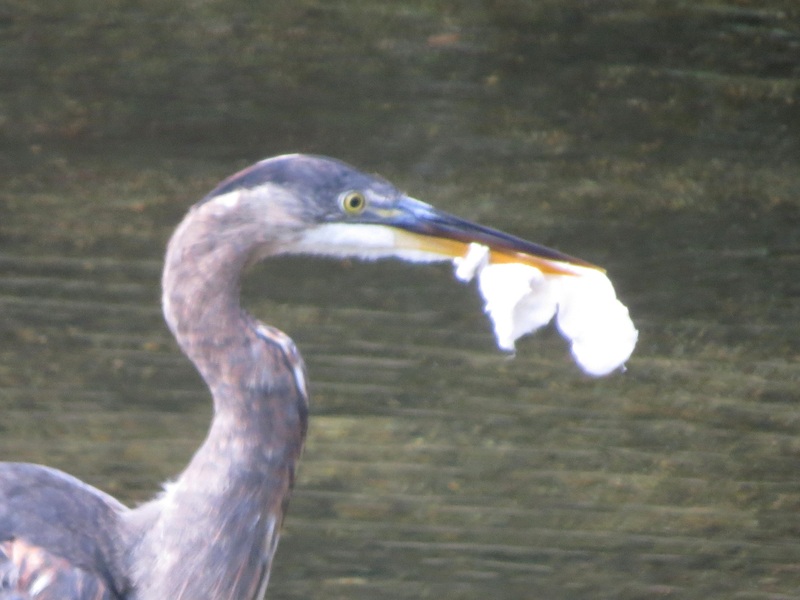 photo of Great Blue Heron with cloth around its bill. LK notified ODFW and they are aware and watching the bird.